A glaring weakness of Google’s Android mobile platform (including the current version, Lollipop) has been the absence of finesse and polish when compared to its key rival, Apple’s iOS. So I was more than pleased when Google today took the wraps off the next version of its Android mobile OS, Android M, at its annual Google I/O jamboree and declared the central theme of the upgrade would be on improving core user experience via polish and quality. Polish and quality – Worthy goals, indeed! And long overdue with Android! 1. Android M is the successor to Android 5 aka Lollipop. 2. Android M will give users greater freedom and flexibility in granting permissions to apps requesting access to location, camera, microphone, contacts, calendar, SMS, phone, and sensor. Previous versions of Android failed to provide users with the granular options that Apple iOS has offered to its users. With Android M, users can now grant or deny permission to individual services like camera, contacts etc the first time the app is loaded. Currently, Android asks users for all permissions at the time of app installation. Mind you, the app flexibility in Android M is only for new apps and older apps will continue to behave as before. 3. Chrome Custom Tab, a new feature of Android M, allows developers to insert webviews directly into their apps making for a smoother experience when users click on a web link in their app. Chrome Custom Tab also lets users take advantage of Chrome features like Sign In, Saved Passwords and Auto Fill from inside their apps. 4. Improvements in app-linking system (i.e. when users move from one app to another app) without opening dialog boxes is another notable feature of Android M.
5. Android Pay mobile payment system is a key aspect of Android M that leverages near field communication (NFC) technology. The new payment system allow users to pay in 700,000 stores with their phones and should work on devices running Android KitKat or higher. Android Pay will be installed in all phones purchased from AT&T, Verizon and T-Mobile and integrated inside third party apps like GrubHub and Groupon. Android Pay competes with Apple Pay which has made significant strides in recent months. 6. A new Doze battery boosting feature leverages motion detection to send devices not in use into “deep sleep’ and extends standby battery life by up to 2X. 7. Native fingerprint scanner support for unlocking devices, making payments via Android Pay and Google Play purchases. 8. Faster charging (3X to 5X) via native USB Type-C support. 9. 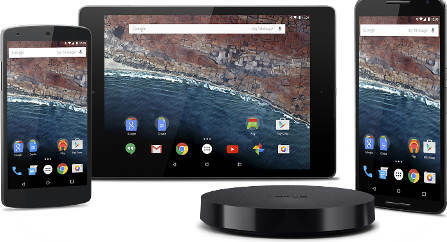 A developer preview of Android M is currently available for the Nexus 5, 6, 9, and Nexus Player devices to let developers hunt and fix bugs. 10. Android M is scheduled to launch in the third quarter of 2015. Besides the above updates, expect to see hosts of minor improvements like simplified volume control and better copy and paste.